A few days before Christmas we traveled with our good friends, Betsy and Lou Kellenberger, to an unusual site in southwestern Georgia. Often called "Georgia's Little Grand Canyon," Providence Canyon consists of several chasms, plateaus, cliffs, and pinnacles. Erosion has exposed the geologic record of several million years within its walls, and minerals have stained the sediments, creating a display of colors that range from white to various shades of pink, purple, red, brown, yellow, and black. 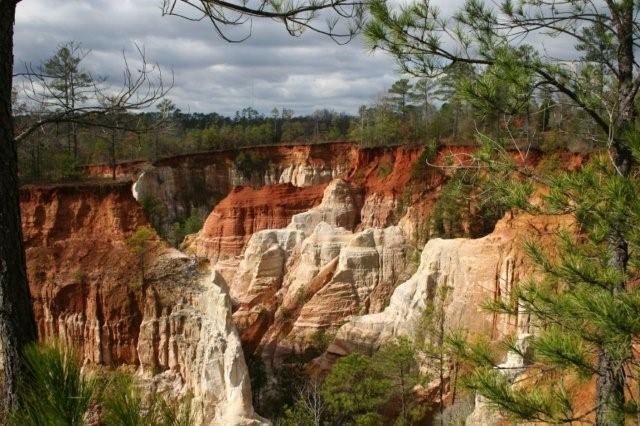 Providence Canyon State Park, located approximately 150 miles southwest of Atlanta, in Stewart County is a 1,109-acre park which includes 16 canyons, some as deep as 150 feet. From a trail along the rim, several overlooks offer views of the canyon walls, in which forty-three different colors of sands have been identified. 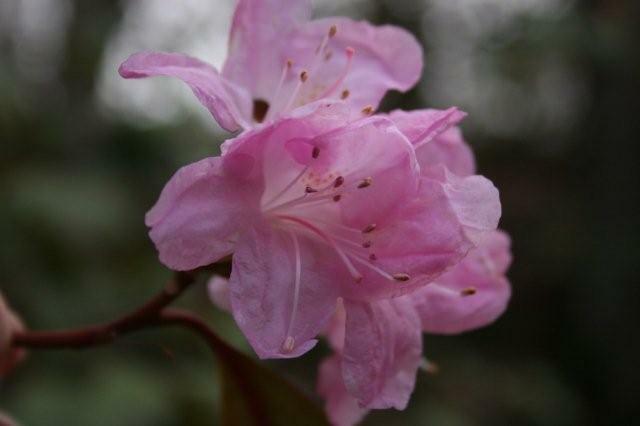 The rare plumleaf azalea (Rhododendron prunifolium), found only in southwestern Georgia and eastern Alabama, blooms in Providence Canyon from mid to late summer, in the largest known wild colony of this species. In spit of the fact that we were there in mid December, there were a few of these in bloom. 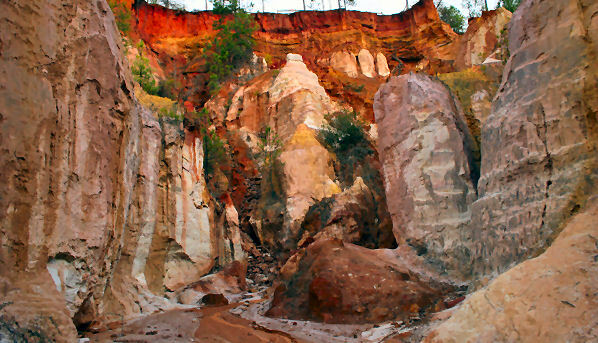 Although the appearance of Providence Canyon evokes comparisons to the landscape of the American Southwest, its history is unique. The canyon consists of huge gullies sculpted of soil, not by the action of a river or stream but by rainwater runoff from farm fields. Historical accounts indicate that the canyon began forming in the early 1800s as the result of poor soil-management practices. Native forest cover had been cleared so the land could be farmed, and early-nineteenth-century farmers in this region took no measures to avoid soil erosion. Small gullies formed and rapidly grew deeper and more extensive. By 1850 ditches three to five feet deep had been cut into the land, further concentrating runoff and increasing the rate of erosion. At one site around the rim of the canyon we found an unusual tree that I had never seen. 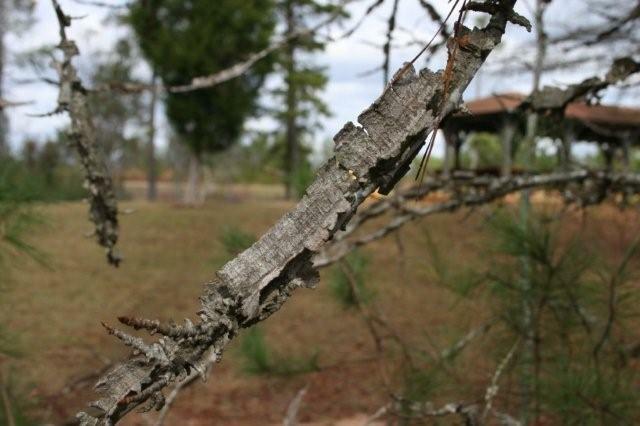 Betsy identified it as a Winged Elm (Ulmus alata); a very hardy, small-to medium-sized tree in a wide range of habitats throughout much of the southern Midwest and Southeastern United States. Other common names are cork elm and wahoo. After our hike through the canyons we stopped for a late Sunday afternoon lunch in the nearby town of Lumpkin, GA. Michelle's Restaurant at 109 Main St, just off the town square, is a favorite of the local folks. The Sunday buffet was filled with great southern dishes like pot roast, fried chicken, ham, sweet potatoes, greens, mashed potatoes and gravy, mac 'n cheese...um um um! All you could eat...$7.50! And they even gave you a take-out box if you couldn't finish your second (or third) plate! As most of you know, we have been sending our "newsletter" every week or two for the past year. During that time we have met lots of new people and added many of them to our distribution list. We thought it would be a good idea to give everyone a chance to get off the list. So here it is...if you want to be on the distribution list to share our adventures in 2008, you will have to send us a reply to let us know. If you want to get off the list, you don't have to do anything! Many of you have already responded, so there is no need for you to reply again...but if you can't remember if you did or not, two replies are better than none. Also, for those of you who might have missed or deleted some of the previous news, we now have a web site (www.pdonovan.net) where you can go and peruse past issues as well as other tidbits of our lives "on the road!"